To meet the challenges of the future. 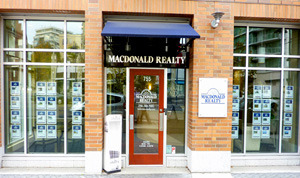 Over the past 65+ years the name Macdonald Realty has been synonymous with a wide variety of purchases throughout British Columbia. Today the Macdonald Realty organization is instrumental in some of the provinces top residential sales transactions and is the leading full service real estate company in western Canada. Macdonald Realty has evolved into the most diversified brokerage, management and consultancy organization in Western Canada real estate industry. The company has built a reputation for integrity, trust, innovation and top professional service. Macdonald Realty has placed first in Western Canada in the Real Trends 200 survey of Canada's largest brokers. Macdonald Realty is the leading marketer of luxury homes in Western Canada and offers a unique and potent luxury marketing program. Headquartered in Vancouver we have offices throughout British Columbia. Our high profile Victoria office is situated in the exclusive Humboldt Valley area of downtown Victoria. Macdonald Realty has affiliations with over 700 firms throughout North America and in over 35 countries around the world. Macdonald Realty is ideally positioned to expand its leading role in Western Canada’s real estate industry through out the twenty first century.